The Northwest Angle, known simply as the Angle by locals, and coextensive with Angle Township, is a part of northern Lake of the Woods County, Minnesota. Except for minor surveying errors, it is the only place in the United States outside Alaska that is north of the 49th parallel, which forms the border between the U.S. and Canada from the Northwest Angle westward to the Strait of Georgia (between the state of Washington and the province of British Columbia). The land area of the Angle is separated from the rest of Minnesota by Lake of the Woods, but shares a land border with Canada. It is one of only six non-island locations in the 48 contiguous states that are practical exclaves of the U.S. 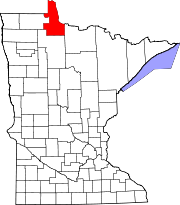 It is the northernmost township in Minnesota and contains the northernmost point in the contiguous 48 states. The unincorporated community of Angle Inlet is located in the Northwest Angle. Although the Angle is listed as one of several distinct regions of Minnesota, its total population was 119 at the 2010 census. The area is mostly water and the land is mostly forest. Angle Township was designated as territory of the United States because negotiators of the initial Canada–US border misunderstood the geography of the area. Benjamin Franklin and British representatives relied on the Mitchell Map of colonial American geographer John Mitchell, which did not indicate the source of the Mississippi River—thought to lie some distance to the northwest—or the true shape of Lake of the Woods, which was instead shown as roughly oval. The 1783 Treaty of Paris thus stated that the boundary between U.S. territory and the British possessions to the north would run "...through the Lake of the Woods to the northwestern-most point thereof, and from thence on a due west course to the river Mississippi..."
In the Anglo-American Convention of 1818, the error regarding the Mississippi River was awkwardly corrected by having the boundary continue due south from the northwest point of the lake, but only to the 49th parallel and then westward along it. The Webster–Ashburton Treaty of 1842 reaffirmed this border. 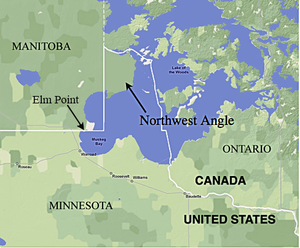 However, the placement of the northwestern corner and shape of the lake meant that this north–south line cut off a section of U.S. territory to its east, now known as the Northwest Angle. Reporting booth at Jim's Corner. Upon entering the Northwest Angle by road, the traveler must enter the booth and report to U.S. Customs via videophone. Before leaving the Northwest Angle by road, one must report to Canadian customs from the same booth. According to the United States Census Bureau, Angle Township has a total area of 596.3 square miles (1,544.5 km2) of which 123.09 square miles (318.81 km2) is land and 473.2 square miles (1,225.7 km2) (79.36%) is water. The land includes several islands, including Oak Island, and two small capes that are below (south of) the 49th parallel north in the extreme southwest part of the township, one of which is known as Elm Point, south of the southeast corner of Manitoba, and not far from the northeast corner of Roseau County. Of the 2000 census population of 152, there were 118 living on the mainland, and 34 persons on the islands in Lake of the Woods. All of the populated islands are north of the 49th parallel. The mainland portion of the township north of the 49th parallel has an area of 116.632 square miles (302.08 km2). The total land area of all islands is 6.303 square miles (16.32 km2), and the two capes total 100 acres (0.16 sq mi; 40.47 ha). The township has the last one-room public school in the state. Elm Point, in Lake of the Woods County, is a small cape southwest of the Northwest Angle. It borders Canada and is, together with a similar smaller cape to the west, separated by land from the continental United States. The Angle can be reached without crossing the international border by crossing the Lake of the Woods. This can be done by boat when the lake is free of ice, by ice road in the winter or by flying over it in a plane. No automobile ferries currently operate on the lake, so vehicles coming from the rest of Minnesota can reach the Angle without crossing the border only in winter. While the ice is forming in late autumn and breaking up in the spring, the lake's surface cannot be crossed safely – at these times domestic access to the Angle is possible only by air. To reach the Angle by land, travelers take Minnesota State Highway 313 northbound ( Warroad, Minnesota, to Sprague, Manitoba) across the Warroad-Sprague Border Crossing  connecting to Manitoba Highway 12 at the border, then to Provincial Road 308, to Provincial Road 525, then finally crossing back into the United States in the Northwest Angle south of Angle Inlet, Minnesota (Angle Inlet Township). The distance from Warroad or Roseau to the Angle proper is approximately 63 miles (101 km) through Minnesota and Manitoba back to the Angle's U.S. border. It is approximately 10 miles (16 km) from the actual border (intersection of Manitoba 525 and NWA Road Dawson) to the rural developments of the Northwest Angle. The border crossing is unstaffed. Travelers using the single gravel road in and out of the Angle are expected to use a telephone at Jim's Corner, Youngs Bay Marina, or Carlsons Landing to contact Canadian or U.S. Customs and make their declarations. As of the census  of 2010, there were 119 people, 66 households, and 37 families residing in the Angle. There were 404 housing units. The racial makeup of the township was 99.2% White (118 out of 119). Native American or Alaska Native of any race were 0.8% of the population (that is, 1 person). There were 66 households out of which 10.9% had children under the age of 18 living with them, 54.5% were married couples living together, 0% had a female householder with no husband present, and 43.9% were non-families. 37.9% of all households were made up of individuals and 3% had someone living alone who was 65 years of age or older. The average household size was 1.80, and the average family size was 2.32. In the Angle the population was spread out with 10.1% under the age of 18, 0.8% from 18 to 24, 10.1% from 25 to 44, 51.3% from 45 to 64, and 27.6% who were 65 years of age or older. The median age was 50 years. For every 100 females, there were 120.3 males. For every 100 females age 18 and over, there were 124.1 males. The median income for a household in the township was $28,500, and the median income for a family was $31,250. Males had a median income of $28,500 versus $21,250 for females. The per capita income for the township was $13,932. About 13.3% of families and 12.3% of the population were below the poverty line, including none of those under the age of 18 or 65 and older. Ernie Pyle wrote several columns about the Northwest Angle and its residents, which were collected in Home Country (1947), published posthumously. The American writer Tim O'Brien set his bestselling novel In the Lake of the Woods (1994) in the Angle. His short story "On the Rainy River" is also set there. William Kent Krueger's novel Northwest Angle (2011) is set in the area. The Danny Orlis series of books, a Christian fiction series for youth, were largely set in the Northwest Angle. ^ "About the Red Lake Indian Reservation". Red Lake Net News. Archived from the original on November 15, 2010. ^ "2010 Census Redistricting Data (Public Law 94-171) Summary File - County Subdivision". American FactFinder. United States Census Bureau. Archived from the original on 20 May 2011. Retrieved 1 May 2011. ^ a b Lass, William (1980). Minnesota's Boundary with Canada: Its Evolution Since 1783. Minnesota Historical Society Press. pp. 47, 48. ISBN 0873511530. ^ Boggs, Samuel Whittemore (1940). International boundaries: A study of boundary functions and problems. New York: Columbia University Press. pp. 48, 49. Retrieved 13 February 2019. ^ "Chapter 5: The 49th Parallel". United Divide: A Linear Portrait of the USA/Canada Border. The Center for Land Use Interpretation. Winter 2015. ^ "Intellicast - Angle Inlet Historic Weather Averages in Minnesota (56711)". www.intellicast.com. ^ Radil, Amy (August 17, 1998). "The Northwest Angle". Minnesota Public Radio. ^ "Campaign 2006: U.S. Congress: 7th District: Collin Peterson". Minnesota Public Radio. ^ Stoddard, Grant (January–February 2011). "The Lost Canadians". The Walrus. pp. 24–31. ^ "American FactFinder". Retrieved 2008-01-31. Wikimedia Commons has media related to Northwest Angle. Northwest Angle Trip Report Visit to the extreme northernmost point of the Angle. "Northwest Angle, Minnesota". NASA Earth Observatory newsroom. Retrieved 2006-04-27.